"As the Director of Summer Quest, I work alongside our teachers and coaches to fill the summer with programs that challenge students mentally, physically and socially. It has been an amazing experience to watch our educators meticulously create, plan and execute their camps. They do an excellent job of creating an environment that allows for learning, exploration and fun!" The Summer Quest office is located in Luck Hall, Room 112. Summer Quest office hours are Monday – Friday, 8 a.m. - 3 p.m.
Summer Quest will be closed on Thursday, July 4. To register, each participant must submit a completed registration form and a non-refundable deposit of $50.00 per course, camp, or extended care sessin to ensure enrollment prior to May 1. Payments by check should be made payable to "Collegiate School Summer Quest." Online registration is also available. Tuition balance must be paid in full by May 1 to continue to reserve each participant’s placement. If full payment is not received by May 1, the space may be given to the next person on the waiting list. After registering, all future changes in registration must be made in writing (via email or written note) and submitted to the Summer Quest Office. The $50 deposit is non-refundable, but, if a participant changes his/her registration, the remainder of the tuition (less the $50 non-refundable deposit per camp) can be used as a credit towards another Summer Quest 2019 program. The credit can not be transfered to future summer programs. All camps and course offerings are subject to maximum and minimum enrollments. Under-enrolled programs may be cancelled. Registration forms are dated and participants are enrolled in the order in which they are received. You will be notified if the program you have registered for is full. Tuition is not refunded or pro-rated for part-time attendance, including situations such as a participant’s dismissal because of a disciplinary action. Campers will not be allowed to participate in a Summer Quest program if there is an outstanding balance. A note must be sent in advance to your child's teacher or coach if you wish to pick up your child during program hours or if they are being picked up by someone else. Summer Quest has the right to use photographs or quotations of Summer Quest participants for future brochures, advertisements and other Summer Quest marketing purposes unless otherwise noted by parents/guardians on the application. The summer months offer students of all ages a chance to grow and thrive outside traditional classrooms. Collegiate's Summer Quest program provides opportunities for youth and adults to have fun, learn and be challenged. We research the latest trends in an array of educational fields to ensure we are developing high-quality and engaging camps that serve as an extension of our School's mission. At the forefront of each camp are amazing teachers and coaches who love to share their passions and help our campers discover theirs. When will the 2019 Summer Quest brochure be available? The 2019 brochure will be mailed to the families on the Summer Quest mailing list in late January. The 2019 camp offerings and schedule will be available online in mid-January. How can I receive a Summer Quest brochure in the mail? 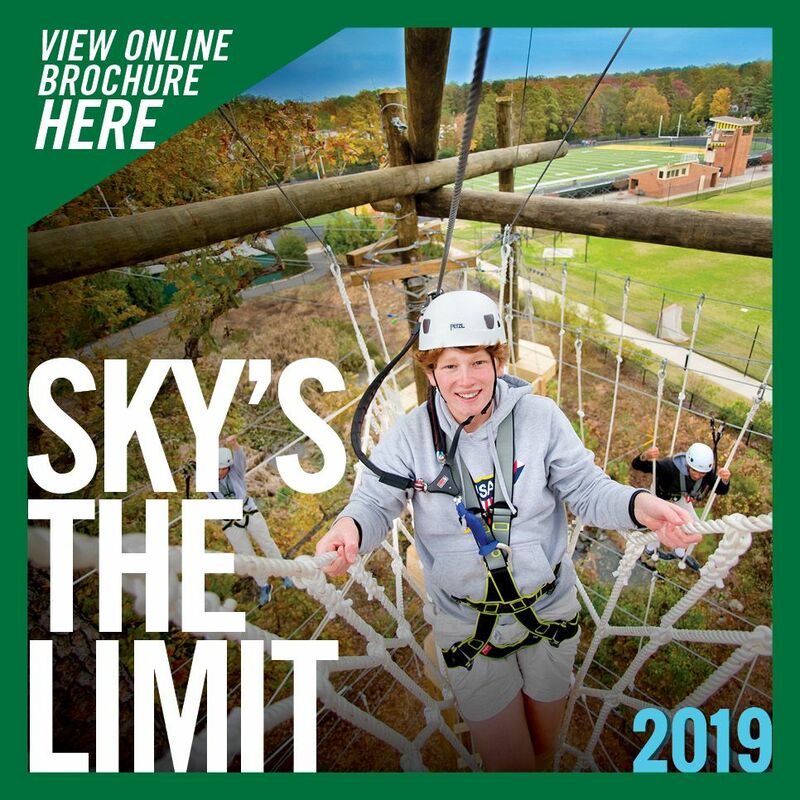 Please enter your mailing information on our online inquiry form if you would like to receive a Summer Quest 2019 brochure. If you received a 2018 brochure, if you attended Summer Quest in 2018, or if you currently have a student attending Collegiate School, you will be mailed the 2018 brochure and do not need to submit an inquiry. When does the registration process begin for summer camps? Registration will begin for Summer Quest 2019 on Friday, February 1, 2019 at 9:00 a.m. The registration form will also be available online for you to download and print out. Back this year ... ONLINE REGISTRATION. Yes! We do offer online registration! A link for online registration will be posted on Thursday, February 1, 2019. You can also download the registration form from our website. My child does not attend Collegiate during the regular school year, but can he/she still register for the summer camps? Yes, anyone can register for Summer Quest camps. For the past several years, Collegiate Summer Quest has had a total enrollment of over 1,300 campers, and 50% of these campers do not attend Collegiate during the school year. How does the deposit process work when I register my child for camps? Prior to May 1, each participant must submit a non-refundable $50 deposit for each camp that he or she is registering for. (Example: If your child registers for four camps, you must submit a deposit for $50 X 4 = $200.) The total deposit (if your child registers for multiple camps or if you have multiple children registering for camps) can be paid in one check written to "Collegiate Summer Quest" or online. The deposit is never refundable unless your child does not get added to the roster due to a full enrollment for that camp. The Summer Quest Office cannot reserve a spot for your child until we receive a $50 deposit for each camp that child is registering for. The $50 is a portion of the total tuition for each camp; therefore, if you pay a $50 deposit for a $200 camp, your remaining balance is $150. The remaining balance for all camps is due by May 1 for us to be able to continue reserving a spot for your child on the camp roster(s). What is the "May 1" payment deadline, and can I still register for camps after this date? Yes, you can still register for any Summer Quest Camp after May 1, but many camps will be filled by this date. When you register for a camp after May 1, you must submit the full camp fee due (rather than just a $50 deposit). The $50 per camp deposit is always non-refundable. However, if you pay your entire camp balance prior to May 1, you can request in writing (note or email) a refund MINUS the $50 deposit(s) for any camp(s) you wish to withdraw from prior to May 1. After May 1, the full tuition becomes non-refundable. The $50 deposit is non-refundable, but, if a participant changes his/her registration to a different camp, the remainder of the fee (less the $50 non-refundable deposit per camp) can be used as a credit toward another Summer Quest program. Many camps fill their enrollments very early in the Spring; so, how do I know if a camp is full already, and how does the waiting list process work? If you are trying to register online and a camp is full the system will notify you that you are being placed on a waiting list. If you are placed on a waiting list no payment if required. If space becomes available in the camp your child is waiting on, the Summer Quest Office will call your home phone to see if you would still like to fill the opening, or if you would prefer to pass the opening to the next person on the waiting list. Can I call or email the Summer Quest Office to "reserve" a spot at camp without submitting a registration form and payment? No, we cannot "reserve" spots at camp without receiving a completed registration form and payment; therefore, names will not be taken over the phone or via email to "reserve" a spot at camp prior to the Summer Quest receiving the completed registration form. We must receive the completed registration form and a non-refundable deposit of $50 per camp prior to May 1, or a payment of the full tuition after May 1 for your child to hold a spot for a Summer Quest camp. I have more than one child who wants to attend summer camps at Collegiate; so, do I need to submit more than one registration form? Yes, please submit a registration form or create an on-line account for EACH child who is attending Summer Quest camps. Please do not submit a registration form that has more than one child's information written on the form. Each camper needs a separate registration form. If you only have one registration form on hand, you may photocopy the original form, download another form from our website, pick up another registration form at the various front offices across campus or from the Summer Quest Office in Luck Hall or email the Summer Quest Office if you would like us to send you an additional registration form in the mail.